Wedding guests won't be able to take their eyes off of this glittering beauty! A real glitter frame wraps around your wording on this bright white 130 lb. wedding invitation. Your wording is printed in your choice of colors and lettering styles. Invitation includes inner and outer envelopes. This product features thermography printing. Thermography is a unique printing technique that results in raised lettering you can feel, which adds to the luxurious experience of this printed piece. Do you like this invitation and want to add a ribbon to jazz it up? Check out our Golden Glow Ribbon Invitation and our Silver Sparkle Ribbon Invitation. I applied my own design to the invitations and sent it as PDF. I received the invitations and they are beautiful. All the process was easy and pleasant. Couldn't be better!!! Wonderful choice, you can't go wrong - especially if you want to add a bit of sparkle to your wedding invites. The wedding invitations were just what I was looking for. I wanted something simple, but not boring. 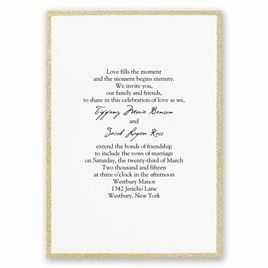 The glitter boarder was just what I was looking for to give the invitation the pop that I wanted to match our wedding sceam. I bought these for my wedding invites. I ordered on a friday and was at my US home within the week. They turned out beautiful. So happy with them. I am extremely pleased with my invitations. I looked for invitations on several other websites but couldn't quite find what I was looking for. This product matched my theme perfectly! Once I received them in the mail they exceeded my expectations. I will certainly be referring Inviatations by Dawn to my family and friends. Great company . Good selection, prompt delivery and beautiful product . I would definetly use this company again and again ! Love this invitation! Customizing it was easy and it came out just as it was pictured online. A few invitations had small flaws on the paper which I think happened in packaging. I am so pleased with the invitations and the price is perfect. The glitter is real so it really stands out and adds a touch of elegance. I would definitely recommend this invitation to anyone who loves a little bling! they were just as I expected they would be. I ordered the Framed in Glitter invitations in Silver for my wedding. I'll admit, I was very skeptical that the paper and printing quality would match what I've seen on other invitation websites, but when I ordered a sample, I was surprised and very impressed! The thermography printing on this invitation gives it a special luxe feel--a touch above flat printing.I was super excited because we had originally budgeted almost four times what we ended up spending, for our invitations! We were able to take advantage of a flash sale to save even more money, and I still can't believe that we got invitations of such high quality for such a low price.The only two minor (seriously very minor) tweaks that I would make to have these invitations be beyond perfect, are to have the silver be just a silver sparkle--as is, there's a slight rainbow effect. It's very pretty, but I think just plain silver sparkle would appear higher-end.The other issue was probably my fault; I didn't order inner envelopes as I feel they are more formal and our wedding is going to be formal of course but not "super uptight formal"--and in trying to be eco-friendly I opted not to get the inner envelopes. Well when you put these invitations in the envelopes, you can see through slightly. Not terribly, but a little bit.Overall, I am very impressed with my invitations. I love the font choices (I used Futura Light and Bombshell), the paper quality, and the overall experience!